Metroid: Other M was released on August 31, 2010 with a MSRP of $49.99. The game was developed by Team Ninja with CG portions made by D-Rockets, and it was published by Nintendo. Metroid: Other M received an ESRB rating of "Teen" with "Animated Blood, Violence" listed as content for gamers and parents to be aware of. 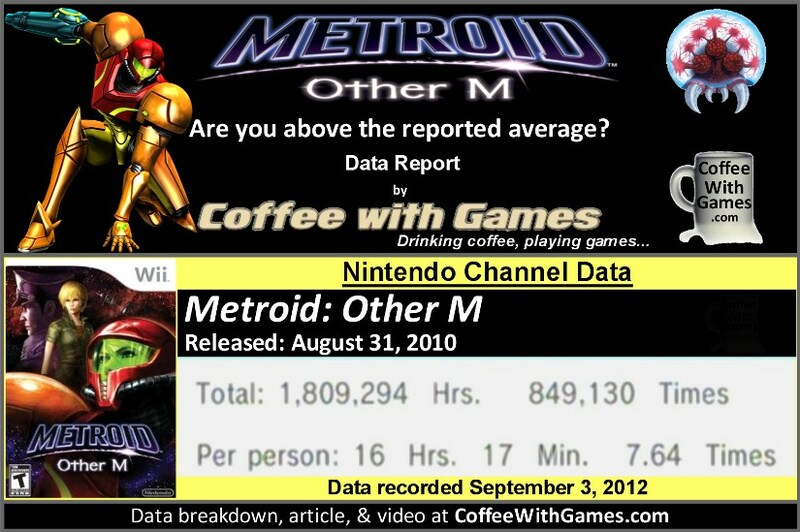 How many hours have U.S. Wii owners spent playing Metroid: Other M since the game released just over 2 years ago now? Brew yourself some coffee, and let's take a look! Metroid: Other M now has approximately 111,142 U.S. Wii owners that have reported game-play data through the Wii's Nintendo Channel, with 734 days possibly reported. The game has about 28,218 more Wii owners that have reported data just since last year's report. Other M's play-time per day/session is now 2 Hours 7 Minutes, and the overall reported average has increased slightly over the last year, now sitting at 16 Hours 17 Minutes as the image above shows. The reported 1,809,294 Total Hours of game-play now is an increase of 481,021 Total Hours since the report last year. What about critic and customer review score averages for Metroid: Other M now? The "professional" critic review score average is still 78.55%, based on 52 reviews on GameRankings.com. The customer review score average is now 72.00%, based on 260 reviews from Amazon.com. I own Metroid: Other M now, thanks a great sale at Best Buy where I purchased the game for only $5 over the Christmas holiday this last year. Even though I own it, I still have not played the game. As a matter of fact, Metroid: Other M is not even in our house right now, as I loaned it out to our neighbor about 2 weeks ago (the same neighbor I'm borrowing Batman: Arkham Asylum from). I haven't had an update from him yet, so I don't know if he has made any progress in the game yet, or what he thinks of it. As for the reported data, seeing Metroid: Other M's reported average still sitting right above 16 hours "Per person" I think is good for the game. While Other M's reported average is lower than Metroid Prime 3: Corruption's reported average, if you can get 16 hours of game-play from Other M, considering its incredibly low new ($9.99 new from GameStop) and used prices in stores and from internet retailers now, I would think it's worth giving the game a chance. One thing I'm wondering about, is with Wii games like Metroid: Other M that shipped with known glitches, will Nintendo make an effort to get them on the Wii U's eShop and have them properly patched up, or will games like Other M stay on the Wii console in retail format only? Have any of you played Metroid: Other M in the last year, and if so, would you recommend it to other Wii owners? Also, do you remember how many hours you put into the game and are you sitting around the reported average "Per person", or perhaps well above or below it? I've clocked in a few hours above that, I believe, for a 100% file and a few hours into hard mode. I'd definitely recommend it. I'm used to Japanese story telling, so I wouldn't have noticed the dialogue that much if the world hadn't made a stink about it. After the fact, you can see that it's more linear than you might expect from a Metroid game, but while playing it, it didn't feel linear. Still enough exploration for the time with it, I felt. Definitely recommend the game, especially considering I've seen it being offered for as low as $10. Do you know if Other M has unlockables for completing it on "hard mode" like Prime 3 did? I guess that was for the 100% in Prime 3 though, so that could be a difference. Not sure now. I'm looking forward to giving it a try, but I need to finish Batman first! I did mention the "$10" in the post, even linked right to it. I know the game has a "glitch" or game breaking issue that can prevent progress, and while I want to read up on it, I don't like knowing too much about games before playing them. I'm guessing you and WesFX didn't encounter the problem, or avoided it because you knew about it? I think it was about a year ago I finally beat the game. I think I sunk about twelve or so hours into it, but I did not bother with the post game searching. Once I beat the proper storyline, I had little interest in the further exploration. Very good game in my opinion, and definitely worth playing. I didn't complete the game 100%, but I beat it. Although, i didn't have any interest in going back to explore, so I ended up trading it in. Despite my trading it in, Other M is still a fun game, although an odd departure from the usual formula. Then again, I just got done lamenting on another site how Zelda is getting kind of stale because of tried and true formula. Perhaps, I should be more appreciative of Other M and pick it back up to add to my library. Oh, and I posted your article on NintendoFuse! haha, figures. I sold my copy not toooo long after beating it. I'm not sure. I don't recall hearing about something like that, though. Pretty sure I've only put in a few hours and despite getting used to the 2d/first person switching, it's a fine game. It's also quite a steal too at $8.99 at newegg with free shipping. Oh yeah, and I'm far from completing it and will probably start over as it's been about a year. Keepin' it real incomplete. It was something about moving forward, then going back to locate a certain item and the item couldn't be accessed or a door couldn't be opened after a certain point. The only way to fix it was if Nintendo mailed you a SD card with a new save file on it...or starting over from the beginning. I'm trying to avoid reading on it now, but that's what I remember from memory. Thanks for providing that feedback on that! I'm going to make sure my neighbor knows about that before he returns it. "Once I beat the proper storyline, I had little interest in the further exploration." Thanks for the comment and feedback on your time with it! "Overall, it's a great game. I'm not so bothered with the story either, besides, Samus could have declined participation in the mission. Anyways, that's a topic for another day." SPOILER ALERT! Samus turns down offer for new Nintendo game after Other M, which is why there was no Metroid at E3 2012. I'm looking forward to playing it, if I can ever reach that point and make time to do it. Thanks for the feedback on it!</b? "Then again, I just got done lamenting on another site how Zelda is getting kind of stale because of tried and true formula." Being that I really, really, really enjoyed Metroid Prime 3, I was actually glad to see Nintendo take a chance with Other M. I just hope I enjoy when I play it. "Oh, and I posted your article on NintendoFuse!" Thanks for the comment and reposting! "It's also quite a steal too at $8.99 at newegg with free shipping." Uggghhhhh...newegg. I have had only one game buying experience from them, and it was enough to turn me off from buying more games from the site. "Oh yeah, and I'm far from completing it and will probably start over as it's been about a year. Keepin' it real incomplete." Starting over definitely helps keep it incomplete. Way to lead by example! I want to play this game again. I played it for a few hours and just stopped one day. It's actually not that bad.